Answering interview questions like, “what motivates you?” or “what motivates you at work?” can be tricky because they are such open-ended questions. It’s not as difficult as it seems if you have the right method, though. I’m going to walk you through a proven method you can use to give a great answer to explain what motivates you at work any time an interviewer asks. Then we’ll look at multiple answer examples for “what motivates you”, so you can make sure you’re ready for your next interview. First, Why Do They Ask This Interview Question? They want to get a sense of your personality and who you are as a person. And how you’ll handle it if the job is harder than you expected to learn and get started in. They definitely do not want to hire someone who will quit and waste their time. So here are some guidelines when answering questions about what motivates you. You need to show them that you’re not just coming to work for the paycheck. Because that’ll put doubt in their mind about how you’ll respond when things get tough. It doesn’t have to be some heartfelt story about how you grandmother had an illness and you dedicated your life to finding a cure, etc. You can say you love collaborating and accomplishing big things as a part of a team, and that’s what drives you to do your best each day (only say this if the job involves teamwork). You can say you enjoy meaningful work… creating products that change people’s lives. But only say this if the company you’re interviewing with actually has products that change lives. If they’re selling payroll software, don’t say this. Everything you say in the interview needs to be tailored to the company. You need to think about the job they’re offering and make sure your answers fit in with that, or they won’t hire you. You can also talk about personal interests that tie in with the job. Maybe you’re a huge fan of playing guitar but didn’t become a professional. So you’re interviewing for jobs as a music producer. Or as a guitar designer. Or a guitar teacher, etc. Another example of this: Maybe you were an athlete in high school and college, and this is what you’re passionate about. This is a great explanation for why you’re interviewing at any job related to athletics and what motivates you each day. This could be for a job as a personal trainer, coach, physical therapist, scout, or any other sports-related job. Let’s talk about what NOT to do now. Don’t just talk about money. Everyone comes to work for a paycheck. The interviewer knows. If they’re asking you “what motivates you?” in an interview, they want to hear something besides money. If you seem too money-focused in your interviews, it’s probably the reason you cant find a job. The only exception is jobs that pay commission, like sales jobs. If you’re getting a paycheck every 10 working days, there are 9 other days where something else will need to keep you motivated. That’s what they care about. Also don’t feel like you need to make up some impressive story. Tell the truth. It can be a simple, straight-forward answer. Being dishonest is not a good idea with this interview question. Remember, never mention money in your answer here! If you don’t know why, go back and re-read the article. It’s one of the most important points mentioned. And remember one of your big goals is to show them that you’ll work hard and “stick with it”, instead of quitting if things get tough. That’s why “What motivates you?” is such a common interview question. If you look at the answer example above, you’ll see the end of the answer is focused on showing them that I’ll stick with the work when it gets tough. You should try to do the same. Those two example answers above got a bit personal. The first one mentions confidence and personal development goals, and the second one talks about addiction and family members. 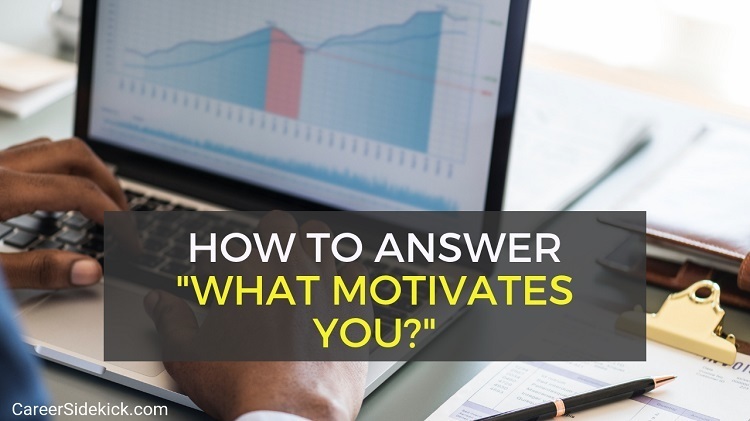 If you follow the tips above you’ll be able to give a great answer when employers ask questions like, “what motivates you?”, “what motivates you to come to work each day?” etc. Your answer to this question can be the difference between getting a job offer and getting rejected after the interview… so as a last step, remember to practice and get comfortable with the answer you’re going to give.